For those of you under 45, you probably never had to write without a computer. I always hated the process of writing. When I was in high school and college, the first thing you would do is outline what you wanted to say. Then fill it out by writing, ON PAPER, whatever your assignment was. Once you edited your paper, you would then type it on your manual typewriter. If you made a mistake, you would have to either correct it by using White-out or start the page over again. Needless to say, it was a long, tedious process and I hated it. I briefly considered law school but decided against it because of the writing involved. Fast forward 25 years. I became president of my synagogue and then another organization. Writing a monthly column for the newsletter was part of the job. But now I had a computer and could write and edit as I went along. Wow! This actually became fun. I no longer avoided writing. Now I have Parkinson’s Disease. One of the side effects of either the medications or the disease, can be increased creativity, along with obsessive behaviors. And that unleashed the need to write. First I started writing for myself. Because I also have a need to research whatever ailment I have, (my OCD) I became a resource to others who were newly diagnosed with PD. As a result, I started receiving calls and emails from people asking me if I would mind talking to their friend or relative who needed information. That is when I started writing for others. I actually wrote about this in a previous post called Creativity and Parkinson’s. That was the reason behind starting the Twitchy Woman blog. I could satisfy the urge to write and reach out to others at the same time. 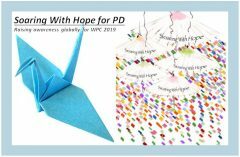 It has been a wonderful experience and as a result, I have connected with others across the US and in many other countries who have PD. We share our stories and information about the latest research and treatments, and hopefully help each other find our way to living well with Parkinson’s. Wow, that’s truly fascinating! I think it’s wonderful that you’re able to use your writing to help people and foster your increased creativity. This was a wonderful read; thanks for sharing! Thank you so much for all you’ve done and continue to do for those of us with PD. Inspirational and informative and I’m gratefulor your creativity. Thank you for your kind words. If I can help even one person, then I have done my job. Oh do I recall the days of paper to pen editing…and manual typewriters! Thanks for having that motivation to write and sharing your thoughts and stories with us. Thank you! All of your responses give me the motivation to continue writing. Continue writing and sharing your words of advice, encouragement, and humor are so helpful and inspiring. I am grateful to you and the dear friend who recommended your blog. Best wishes.